While I was walking to an appointment in downtown Toronto, I saw some girls get out of a car and something immediately caught my eye. The sign on the dashboard let me know it was a ride share and from the outside it looked like an ordinary car but that’s where the similarities ended. This is Remel, and Remel is clearly no ordinary ride share driver. I bet he is the best tipped driver in town! 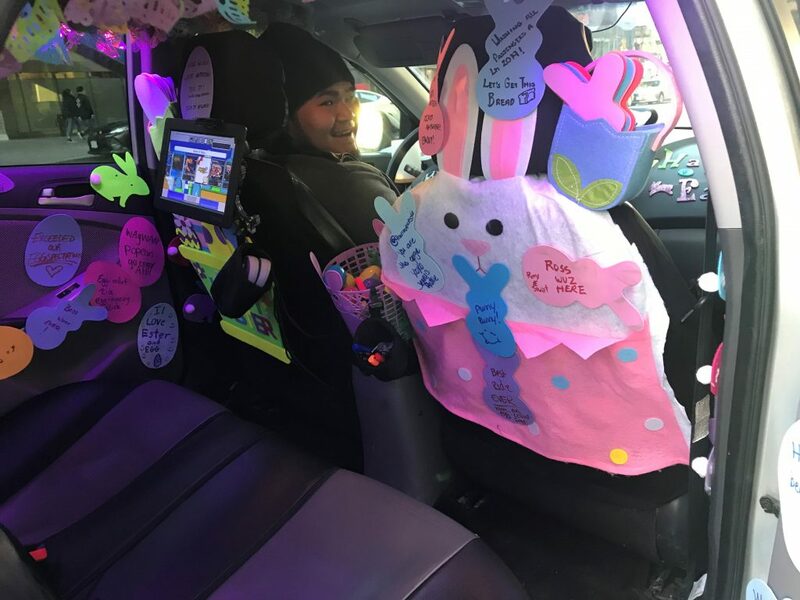 He decorates his car regularly for various occasions and provides not just a ride, but an experience for his customers. They are invited to help decorate with markers and die cut outs that he has made available. They write inspirational messages or notes to adorn the vehicle with (even the ceiling was covered). Remel engaged his customers, he encouraged them to have fun, he surprised them. He delighted in their delight! He gave them something to talk about around their dinner table that night. How do you think his customers felt when they entered/left his vehicle? Remel did not have to do this, no one made him or told him to, he chose to do the unexpected and he was happy about it! He gets that giving his customers a great experience is going to make his experience better too. Who is your ‘customer’? Maybe it’s a typical one, but what about if we thought about our colleagues, our family, our friends, our community, our encounters this way? What if we think of everyone as our customers and realize that we have an opportunity to create experiences for people, to help people shift their frame of mind, to lighten up, to engage. Of course it’s not always possible but it’s possible sometimes. It’s possible once in awhile. It may take some purposeful, deliberate and intentional planning or it may be spontaneous and quick. Creating an experience that will make someone look up, lean in and engage, it’s just one more way to live Your Life, Unlimited! This entry was posted in Blog, Happiness, Newsletters, Positivity, Relationships and tagged e-news, happiness, Inspiration, positivity, Stephanie Staples, Your Life Unlimited. Bookmark the permalink. love how you always make me think….. Previous Previous post: Real Life, Captured. Next Next post: Take it and Take it!